A luxury property Frontline Beach Penthouse in La Morera a beautiful gated and secure urbanisation on the beach at Los Monteros Playa on the eastern side of Marbella. It has been refurbished to the very highest standards with all new bathrooms, kitchens and full B & O music system throughout. Presented in perfect condition, it should be seen to appreciate the level of the property. Spectacular open views over the beach with several terraces to enjoy the all day sun and a very large solarium terrace with full dining, chill area and BBQ. 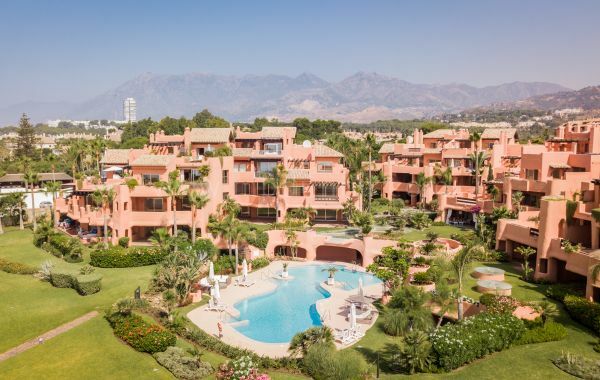 La Morera is one of the top beachfront urbanisations in Marbella and is fully gated with excellent 24-hour security. Beautiful community areas and pools, indoor pool and gym. This penthouse is one of the prime units in the complex as it is the on the southwest corner of the urbanisation. It is truly a unique property and we highly recommend viewing for anyone looking for a superior front line beach position in a secure location. La Morera has 10.000 m2 of semi tropical gardens and a beautiful pool area with amazing views. It has security on site twenty four hours and is fully gated. It also has an indoor pool, gym and sauna.